What's new? 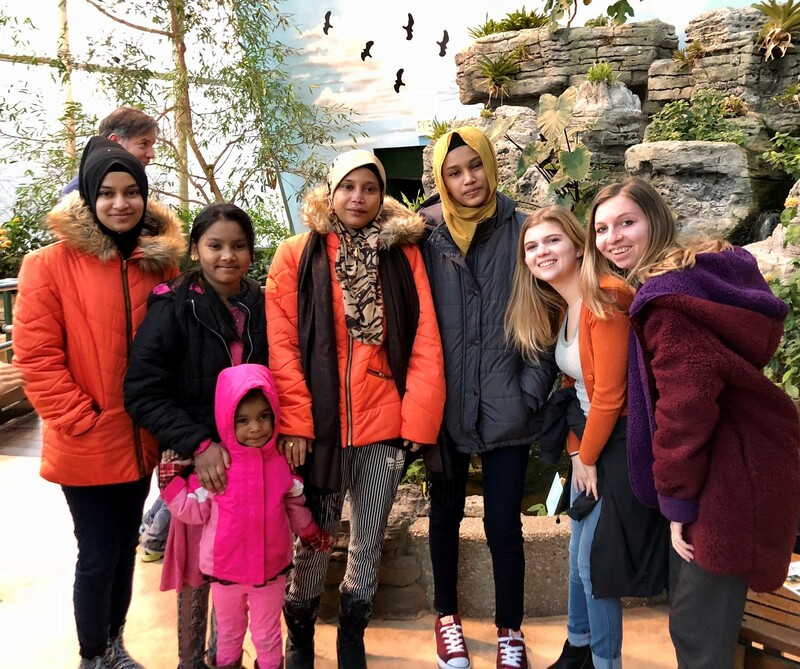 In November, Norizah and Azizah were enrolled in Chicago Public Schools and a dedicated team of NSCI volunteers has helped Norizah and Azizah with their homework on Wednesday afternoons. Other volunteers visited with the family on Sunday afternoons, teaching Annuar important skills such as how to safely use their kitchen appliances and manage their finances, as well as treating the family to fabulous experiences around Chicago. 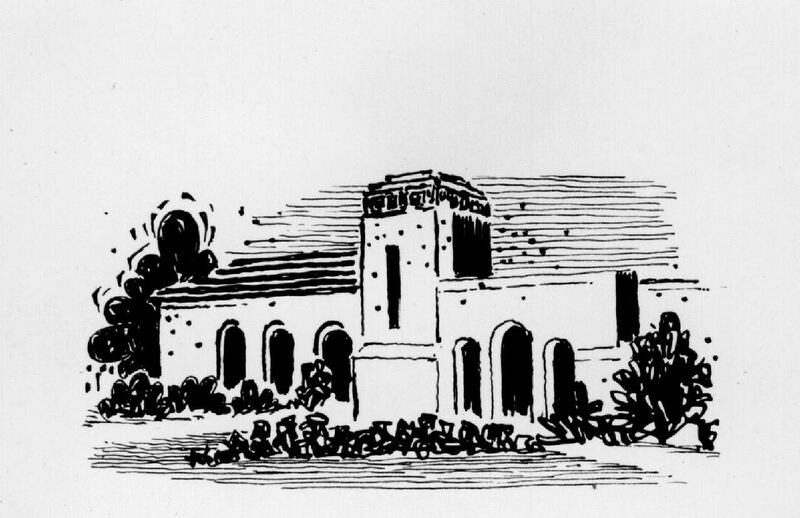 Torah reminds us 36 times that our people were once strangers in the land of Egypt, and so we should, therefore, empathize with the most vulnerable among us. We know what it is to wander the wilderness, sleeping in makeshift huts, uncertain of the future. Therefore, our faith calls upon us to act. On October 17, 2018, North Shore Congregation Israel welcomed The Mohamad Ayub Family. They are Rohingya. Annuar (33) fled Burma with her family when she was very young, and most recently, she has lived with her two children, Norizah (16) and Azizah (13), in Malaysia. To learn more about Burma and the Rohingya people, please click HERE. We were not the only ones waiting for them at O’Hare. 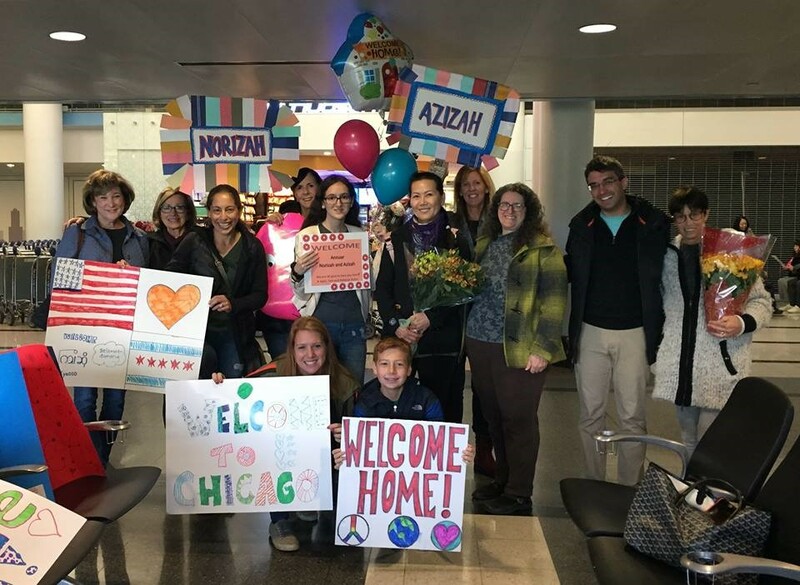 We learned while gathered in the terminal that Annuar’s husband, who died ten years ago after battling cancer, has a sister who was also resettled here in Chicago with her children. They all, too, gathered on that Wednesday morning with us. A welcome surprise, we quickly made friends as Annuar’s Chicago family arrived a few at a time. Ranging in age from newborn to twenty years old, Annuar’s nieces and nephews are all enrolled in public school and the oldest also work to help support their family. The eldest son works two jobs while also attending college. In the weeks before the family’s arrival, our community donated housewares and money for furniture, ensuring that Annuar and her daughters would be comfortable when they arrived to their new apartment in Rogers Park. The weekend before, volunteers schlepped carloads of housewares into the city and up flights of stairs to the apartment, sorted boxes of donations, cleaned and organized the closets and kitchen cabinets, caulked the bathtub and scrubbed the toilet & sink. We arranged the living room furniture and made minor repairs, and lovingly decorated the apartment so that it would be comfortable for the family when they arrived. More than decorating the apartment so that it was ready for them, we came together to create a home for the newest members of our community, and modeled our sacred obligation as Jews to welcome the stranger. In the coming months, NSCI volunteers will meet weekly with the family for both friendly visits and to help tutor all three in English and help Norizah and Azizah with their homework. They, like their cousins, will soon be enrolled in Chicago Public Schools. If you have any questions about this new initiative or wish to get involved, please contact Rabbi Daniels: (847) 835-0724 or rabbidaniels@nsci.org. If you are able to help, please make checks payable to “NSCI” and write “Refugee Resettlement Project” on the memo line. Please mail checks to NSCI, Attn: Rabbi Daniels, 1185 Sheridan Road, Glencoe, IL 60022, or click HERE to donate online.